The cathedral was built in 1790-1827, but it retains some portions of the older building, notably part of the east end (possibly the work of de Courcy), with its recessed doorway and trefoil niches. Within, arcades survive from the 13th, 15th and 16th centuries, and the font (retrieved in 1931 from a farmyard after being lost for centuries) is believed to be medieval (11th century). The walls are embellished with coats of arms of county families, and several of the early 19th century box-pews have semi-circular fronts. The rebuilt organ dates from the late 19th century. In the wall beside the porch is the Cromwell Stone, commemorating Edward, third Baron Cromwell (d. 1607), governor of Lecale. There is a good view of the Mourne Mountains from a terrace behind the cathedral. The monolith carved with the name Patric, purporting to represent the tombstone of the saint, is a bogus antiquity; it was placed there in 1900 by the Belfast antiquarian, Francis J. Bigger (his collection of antiquities is on display in Jordan’s Castle, Ardglass). No trace remains of the Round Tower which once stood to the south, but a 10th century High Cross, pieced together in 1897 stands near the east end of the cathedral. The tower (1560) of the parish church (1735), in Church Street, to the north of the town centre, may have been part of a castle erected by De Courcy. Thomas Russell (1767-1803), the United Irishman, was executed in Downpatrick and lies in the graveyard. 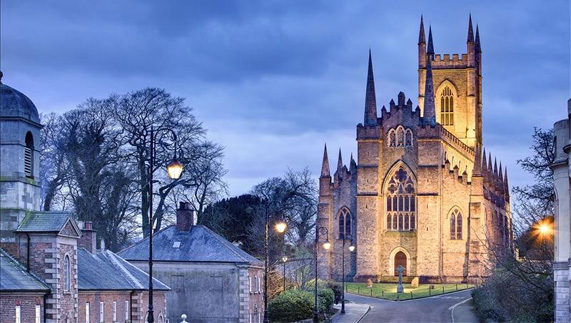 Downpatrick Cathedral is a must see on your Ireland tours.